The month of May seemed to flash past, but with the occasional period of hurry up and wait. Brian finally recovered from his lurgy – maybe it was Norovirus that has been on the news! Anne-Inger recommended ginger tea – an infusion of the chopped up raw root. That seemed to do the trick. He then commenced work on the remodelling of our “bathroom” which lasted for the next three weeks! Our friends Birgit and Syd on Seraphina were setting off soon along with the Norwegians Anne Inger and Morten (and their dog Loeve) to visit Syracuse. 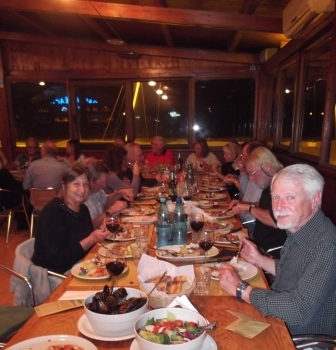 We accompanied them to a good restaurant on the harbour front and had a great farewell meal. I had lamb and artichoke hearts for the main course which was a nice change – we have not seen lamb in the shops very much. 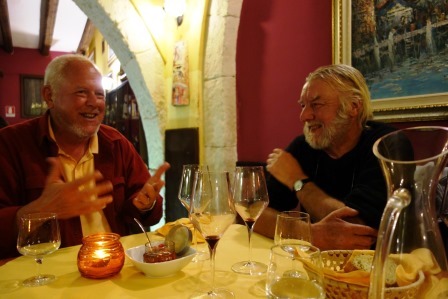 The next day was a big outing with our history “professor” to Naru and Palma di Montechiaro. As usual there were too many churches but we did manage to visit the castle in Naru. The road up the narrow streets to the top of the hill passed many renovated old houses – as well as a fair few dilapidated ones. We were told that a previous mayor of Naru had given away abandoned houses in the old town to anyone who would take them on condition that they paid for renovation! That sounded like a clever ploy to improve the place. There was also a print gallery with some very nice prints – a Goya and a very small Rembrandt as well as a selection of modern ones with artists I didn’t make a note of. 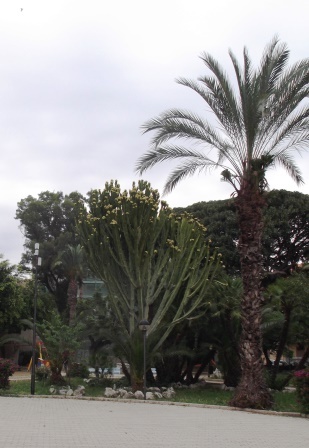 In Palma, apart from lots of churches there was an interesting palace. The Montechiaro’s mostly went into the church (both men and women) and were very devout, so built themselves monasteries and convents as well. The palace had a long entrance ramp up one side and round a corner to the first floor – the Count liked to ride his horse up there! The large rooms on the first floor were host to an exhibition of lacy Victorian religious cards – very fine designs and many multi-coloured. 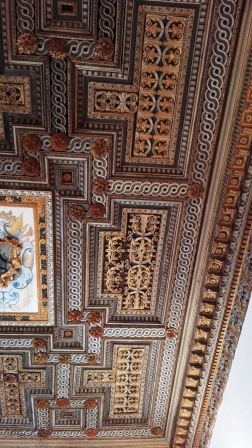 The wooden ceilings had various depictions of the coats of arms of the occupants. 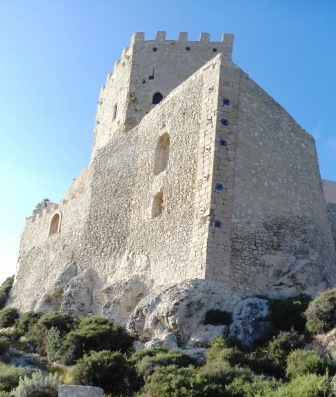 Finally we headed off to the castle Montechiaro on the coast which housed an exhibition of Victorian costumes. One of the group has made a study of clothing and the political connections (i.e. expanding empires) and explained some of the history. It was a very long day, so I had a “duvet day” after that! I had previously found some flexible plastic sheet that I thought would make good frames for mosquito screens for our “port lights” – the opening side windows. Having pondered the best way to do it, I cut 2cm strips of the plastic and bent them around the inside of the frames, secured with a bit of insulation tape. Having left these in place for a few days they held the shape to an extent, and I then taped net to them (not as simple as it sounds) and stuck them into the frames. It more or less works and they haven’t fallen out yet! However the mosquitos still find their way into the boat during the day and we have had a few disturbed nights as they zoom in on us while we sleep. That week I got an email saying that our broken Dremel was being returned – replaced with a brand new one! Wow – what service. It came in a very nice zipped box too – which I have yet to find a use for. 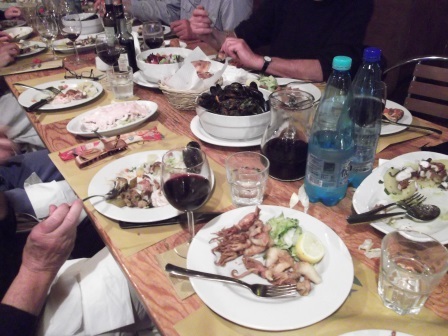 Another night we went out with a crowd of about 20 people to a restaurant on the beach east of Licata – transport arranged by the restaurant which was fortunate. We had a good time and chatted to a few people we had not properly met before. The food was excellent and too much as usual. They just brought out selections of dishes that we passed round. Matt (our helper in the yard) arrived with a couple of mechanics who spent a couple of hours re-aligning the engine with the propeller shaft. The next day Matt wanted to test it out, so we untied the boat and went out for a short spin around the harbour. It really does seem to be much better and much less vibration than before. On our way back in we unfortunately got taffled up with next door’s mooring ropes and had to be rescued by the marina boat! Oops! Many more people were beginning to make plans to head off for the summer. Quite a few went to Malta, some to Tunisia and others heading either east or west depending on their plans. So all of this time, Brian planned and executed the various jobs he needed to do to remodel the bathroom. First off was removal of the holding tank. This gave him access to the fresh water pump that seemed to be not as effective as previously. Even cleaning out the filter didn’t improve it, and it was quite old so I ordered a new one from a supplier on Amazon (Italy). We have been trying to ensure we do all of these upgrades while we are in Europe as it is difficult to get things imported to Turkey. Another headlining was hanging down – this time in our “wet cupboard” where we hang our coats, so that had to be fixed, trying not to cover everything in black dust. I managed to clean out the forward water tank too, which was on the list of tasks, then found that the top leaked again so that was another fix to be fitted in. As we worked our way through the things affected by the remodelling (fitting new pipework involved removing and then remodelling various cupboards and lockers!) Brian kept finding better ways to fit the rather recalcitrant pipework. The new (white) pipe is a few millimetres bigger than the old despite advertising itself as the same size so just doesn’t quite fit as it should. May arrived with strong winds that didn’t really let up all month other than a few days of calmer weather. We all get fed up with the wind and moan about it frequently! My task for most of the month was to polish the smooth parts of the deck. I had bought some 3M boat polish that says rub “aggressively” – so it takes quite a long time. It looks much better now I have to say. 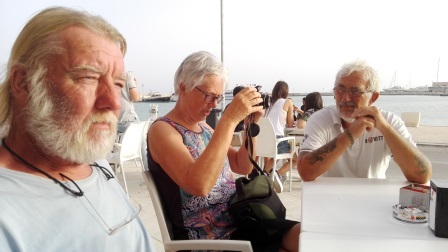 As a reprieve from this, Kevin and Ann from Sailaway (berthed in Ragusa) came to visit. They had had a horrendous few months with their boat in the yard. It is steel and had corroded significantly, to the extent that it was leaking in several places. 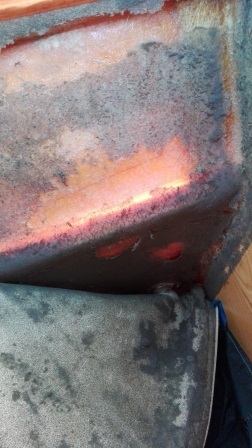 Zinc anodes are supposed to prevent this but the ones they had put on in Turkey had not worked at all. They had had to strip out almost the entire inside of their boat so that the yard could weld on new plate over all the corroded areas. What an undertaking. They survived, however, and it was great to see them. We ambled around Licata. 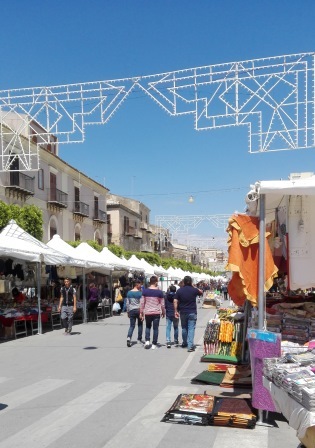 It was Saint Angelo’s fiesta and the main streets in the town had been closed to traffic and lined with market stalls as far as the eye could see. Saint Angelo is Licata’s patron saint (he was killed here) so it is a big thing. Later I went to the church to see the start of the parade. 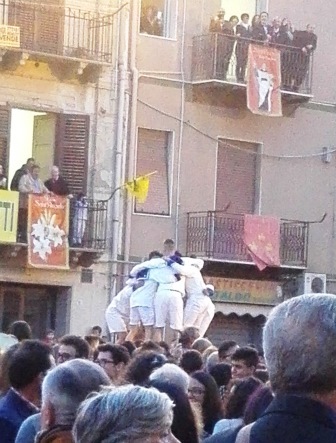 The square was full of young lads in sailor suits – they were building human pyramids and making a lot of noise. 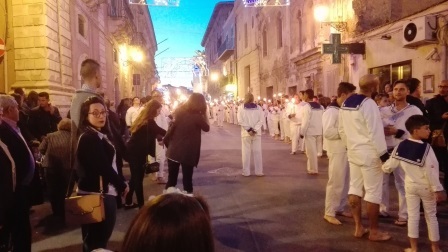 A few older ones also in sailor suits arrived and they started gathering their candles for the procession. 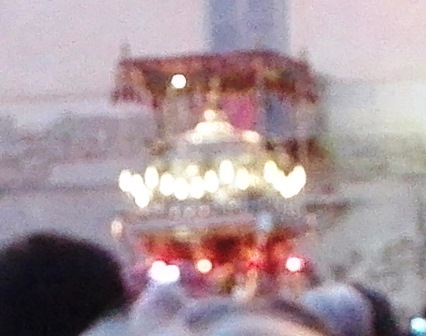 On the dot of 8pm a string of huge firecrackers went off, filling the square with smoke, and then the reliquary (huge silver and gold object – shrine? 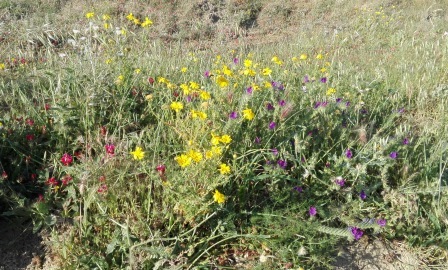 I don’t know the name to describe it) was carried out on the shoulders of strong men and taken along the back streets. Everyone crowded around to follow it, as did I. 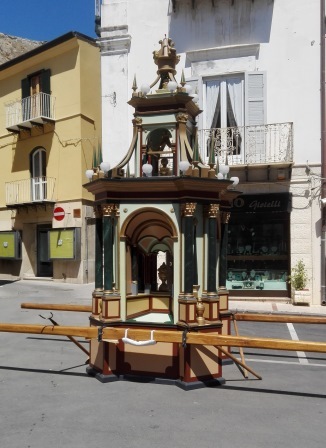 It then arrived in another small square where four more of these shrines were situated – two of which were picked up and followed Saint Angelo down to the harbour. I gave up at that point and retreated back to the boat! During the following weeks Brian’s bathroom design continued to take shape. Translucent plastic for sliding doors etc. 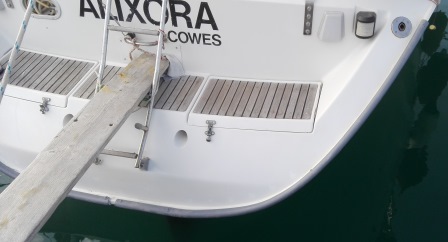 The plastic sheet is 2mm thick, the profile for sliding doors has gaps of 2mm – but of course they are so tight that he had to sand the channels down to fit. Nothing is ever straight forward. The back of the cupboard is now lined with a foil backed sheet and thin translucent plastic, and a shelf inside means all the bottles don’t fall down into the V shaped hole! 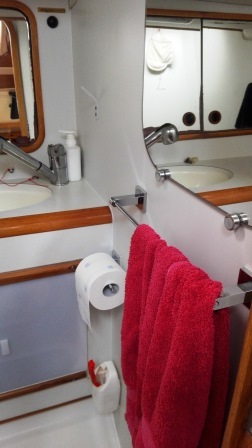 He also found a very nice stainless towel rail and toilet roll holder, to replace the original ones which were getting a bit tatty. Also the hooks for flannels etc were decidedly suffering their age so he made new ones from offcuts of the plastic he got for the sliding doors – ingenious. The finished job is really good. During all this work inside the boat I was pretty much restricted in what I could do. 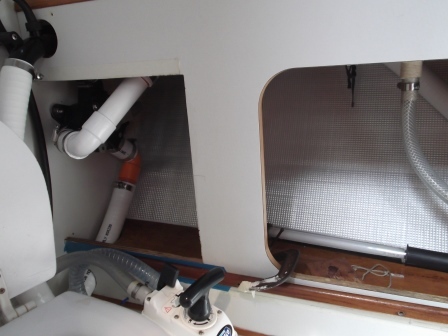 I did manage to get a bit more sewing done – repaired the bimini yet again to patch a few small holes, made a new fender cover etc. And of course continue polishing the deck and cockpit areas! 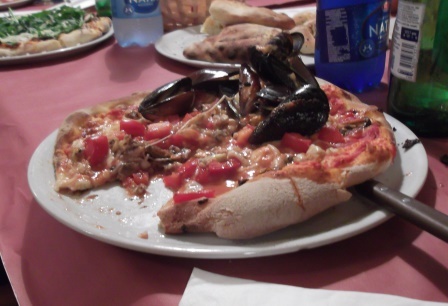 We had another good night out for pizza with a gang of people who were preparing to leave and we maintained our Tuesday nights out at the marina café joined by a smaller selection of people from time to time. Then it was time to retrieve our genoa (front sail) and dinghy from the marina storeroom. I cleaned the side of the boat from the dinghy. During the previous couple of weeks it had rained covering the boat with a layer of red sand from the Sahara. I washed it all off – then it did the same again! And it was very overcast some of the time and sand just dropped out of the air. 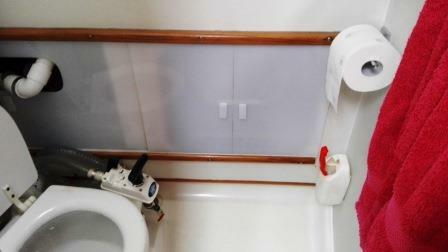 Brian had found some tougher plastic mosquito netting and we created a rather smart roller blind system to hang it over the companionway. That took a couple of days of design, fitting and alteration to make it work! It does seem to work though – perhaps a few more modifications to perfect it! Then it was time to replace the rubber strip round the flange that sticks out at the back of the boat. The plan was to just turn the existing one over as it had deformed some of the screw holes we had made. This worked up to a point but a split then bulged out. Aha we thought – we have a length of the rubber that hasn’t been used – we will cut the old one in half and put the new bit on the other side! Then we spent two afternoons trying to get the new bit to slot on – and failed. So the old half had to go back on with the split on the bottom! Brian has now painted it all white and it looks fine – so long as you don’t look too closely. He had to do all this from the dinghy while I assisted from the deck – not an easy task. When it was time to put the genoa up we washed all the sand off again. Then a morning heaving the sail up and putting the new lines onto it. It is heavy and it is really hard work to get it up the groove that holds the front of the sail to the rolling mechanism. I broke one of our new winch handles too – not a disaster but annoying. 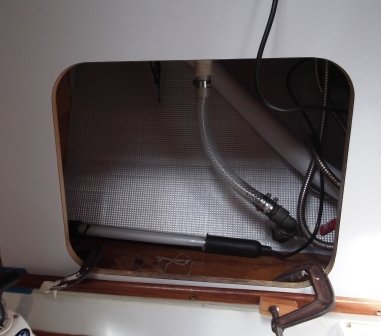 The sewing machine came back – via our friends who had a rip in their main sail. Ginny, Guy and I worked on the front of their boat getting the machine to put some stitches into webbing to hold the small rip together – it was hard work and the machine didn’t like it much, but it will hold for another season. Ginny had put in a lot of work with sticky sail repair tape and hand stitching too – so it looked pretty strong. As you might deduce, we were approaching getting ready for departure! This was heralded by the creation of the final list of jobs. 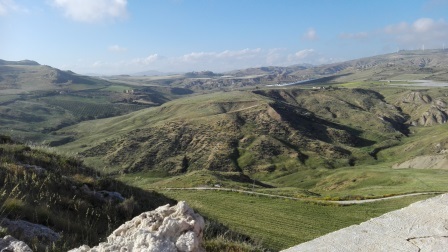 Erik (our Norwegian friend in Ragusa) had said he wanted to buy Brian’s bike and would we bring it to Ragusa. I took my bike back to the shop, where after a bit of discussion I got €100 for it – not bad. We returned the big gas bottle that we had bought, did last minute shopping and checked out the weather. 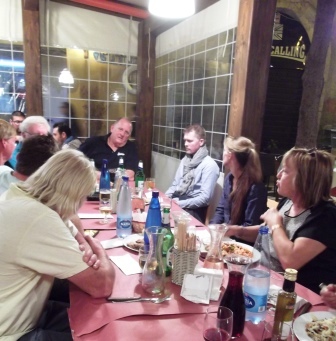 Finally it was time to leave – we arranged to set sail for Ragusa on Sunday 29th May. It was fairly calm – not much actual sailing apart from a rather lively episode around lunchtime (as always). The engine really seems to run more smoothly and it was a lovely day once the clouds lifted. Brian got slightly sunburnt. Naturally, the wind picked up when we were about an hour away from our destination but Brian guided us into our slot here without too much difficulty. We met up with Erik and Eva (and their dog Arja) and went for a drink with their friends before retiring for a late dinner. They have their own car here and are driving back to Norway tomorrow. Erik has been really kind and took Brian up to the petrol station and gas station to fill up our diesel cans and gas bottles. We joined them for a drink that evening to celebrate Eva’s birthday. We are here for another day or three, and then plan to head straight to Kefalonia (Greece) which will take 3 days at sea. Having set off so late this year we have some catching up to do!